 Live2Lead: Irving returns to Singley Academy on November 14. Held live in Atlanta, the event is broadcast to more than 300 countries around the world. This year, choose from two sessions – both featuring today’s top thought leaders. Come to be inspired and uncover specific, actionable strategies you can implement immediately to begin making an impact. MORNING SESSION IS SOLD OUT! Please join us at the evening session! 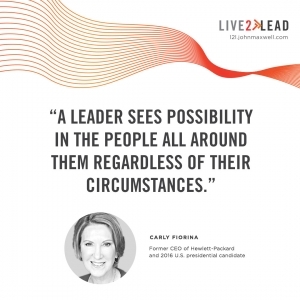 Live2Lead is a half-day leader development event featuring dynamic leadership experts. Held live in Atlanta, the event is broadcast to more than 300 countries around the world. Join us at Singley Academy on November 14 to be inspired and uncover specific, actionable strategies you can implement immediately to begin making an impact. Live2Lead speakers share next-level advice on everything from building loyal clients, help you make educated and smart business decisions, and help you grow your business. Learn from leadership experts including John Maxwell, Daniel Pink, former presidential candidate Carly Fiorina, and professional adventurer Debra Searle. Be a part of something BIG: This year, more than 1500 high school students from Irving ISD will participate in the event. See the students of the Singley Academy culinary program in action. Hear from two students in the Irving ISD entrepreneurial program. Help grow tomorrow’s leaders and leave inspired, motivated, and ready to shift. Live2Lead:Irving is sponsored and presented by Mark Fenner, President and Founder of Rise Performance Group. Mark knows leaders and the contexts they need to grow – and has a unique ability to create the conditions needed to deliver a material change in performance. Mark has been a John Maxwell Certified Leadership Coach since 2013 and is an Authorized Partner with Wiley & Co., offering their PXT Select and CheckPoint 360 leadership assessments as well as Everything DiSC and 5 Behaviors of a Cohesive Team. Combining this training with decades of on-the-ground experience, Mark has helped hundreds of organizations shape their workforce into world-class leaders, transform clients into die-hard fans and build cultures that eat strategies for breakfast. Mark believes that people are the lifeblood of your organization. He’s created, built and led high performing teams – each time refining his instincts about the driving factors behind great leadership and backing them up with metrics. Mark’s success in building exceptionally high performing sales and leadership teams in the technology industry is making him a mainstay of the speaking circuit and the leadership consultant of choice for high-innovation organizations. Mark has years of experience creating organizational cultures where employees stand behind the organization, its goals and its mission. Because when the structure, cadence and rhythm is right, their innate leadership potential comes to the forefront – it simply needs to be unleashed. But at the end of the day, Mark believes in helping leaders become more, so they can do more, so they can give more. Check out the 2018 speaker line up! John will teach about the kinds of shifts every leader needs to make. 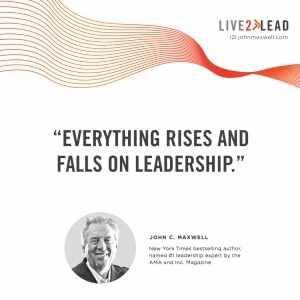 John C. Maxwell, the #1 New York Times bestselling author, coach, and speaker who has sold more than 26 million books, was identified as the #1 leader in business by the American Management Association and the world’s most influential leadership expert by Business Insider and Inc. magazines in 2014. In that year, John also received the Mother Teresa Prize for Global Peace and Leadership from the Luminary Leadership Network. His organizations – the John Maxwell Company, The John Maxwell Team, and EQUIP – have trained more than 6 million leaders in every nation. Daniel will teach the art of knowing the right time to make a shift. 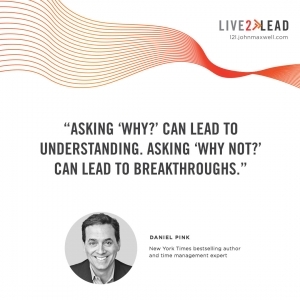 Daniel H. Pink is one of the best-selling nonfiction authors of the last decade. His books on work, business, and behavior have been translated into 35 languages and have sold more than 2 million copies worldwide. His books include the latest publication, When: The Scientific Secrets of Perfect Timing (January 2018), which explores the science of timing in our lives. In 2015, London-based Thinkers50 named him, alongside Michael Porter and Clayton Christensen, as one of the Top 10 business thinkers in the world. His TED Talk on the science of motivation is one of the 10 most-watched TED Talks of all time, with more than 19 million views. His RSA Animate video about the ideas in his book, Drive, has collected more than 14 million views. Carly will teach the art of recognizing the opportunity for a shift. Carly is a true leader and a seasoned problem-solver. She is a passionate, articulate advocate for entrepreneurship, innovation, and effective leadership. Carly was recruited to lead HP in 1999, during the worst technology recession in 25 years. While there, she re-focused the company on innovation and market leadership again. Under Carly’s leadership, revenues grew, innovation, tripled, growth quadrupled, and HP grew to become the 11th largest company in the U.S.
After leaving HP, Carly focused her efforts on giving back. Prior to announcing her candidacy for the Republican nomination for President in 2015, she served as the Chairman of Good360, the world’s largest product philanthropy organization, and as Chairman of Opportunity International, a Christian-based organization that lifts millions out of poverty around the globe through micro-finance. Debra will teach the art of courageously choosing to make a shift. 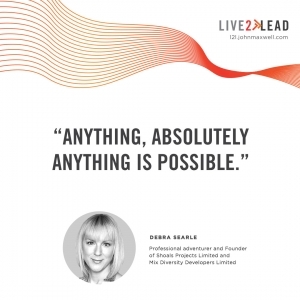 Debra Searle is a professional adventurer and serial entrepreneur. Her expeditions have included rowing solo and unsupported across the Atlantic and sailing around Antarctica. As well as other expeditions across the globe, she has also launched four companies, is a published author, has worked as a host for the BBC and won gold medals for Great Britain at World Championship level. Debra’s spirit of adventure gained her an MBE from Her Majesty the Queen and a place on the board of The Duke of Edinburgh’s Award. She later co-founded the Business Women’s Network Forum which meets at Buckingham Palace. Tyler will teach about the hard work that goes into make the right shifts. Tyler Perry is an established American actor, director, screenwriter, producer, playwright, author, and philanthropist. Tyler’s first feature film, Diary of a Mad Black Woman, debuted at number one nationwide in 2005. In the decade since, the 18 films he has directed have all been met with massive commercial success and grossed nearly $2 billion. He has also been on the other side of the camera for several directors. He has made an indelible mark in the television space, beginning in 2007 with the debut of his TBS series “House of Payne” which broke cable rating records. He continues to be successful in the TV arena today. Join us at Singley Academy on November 14 to be inspired and uncover specific, actionable strategies you can implement immediately to begin making an impact. New for 2018! Choose the morning or evening session! Both sessions feature the same speakers and networking opportunities. Proceeds from both sessions benefit Irving Schools Foundation. Live2Lead is held live in Atlanta and then broadcast to more than 300 countries around the world. Speakers will not be live in Irving. All proceeds will benefit Irving Schools Foundation which provides financial resources to maximize educational opportunities for teachers and students in Irving ISD by funding innovative programs, scholarships, and activities that enhance creativity, leadership, and academic success. 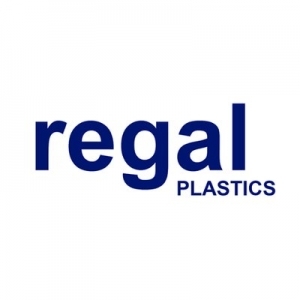 We want to thank our partnership sponsors for making Lead2Lead: Irving 2018 possible!